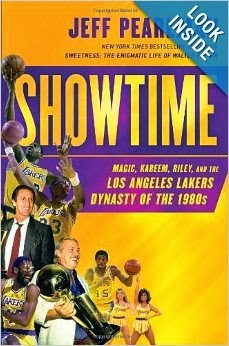 Showtime by Jeff Pearlman was on the Los Angeles Lakers team of the 1980s and would be a great read for a Lakers fan, and was still an interesting one for myself as not a huge basketball fan. Some of the things in the book that stood out as fascinating included what Magic Johnson was like coming in as a breath of fresh air rookie, the details of his ridiculously great performance at center that year to win the 1980 NBA Championship and his womanizing. Also particularly interesting in the book (and covered in an excerpt for Sports Illustrated) was info on how Pat Riley became head coach, with first Jack McKinney in charge, him suffering a devastating head injury and Paul Westhead taking over, and then Westhead following up initial success with becoming an overbearing force on his team, much like Riley would later do on both counts. In this regard, Pearlman tells a fascinating story throughout the book of how people would change with success and fame. Again, I went into Showtime as someone who loves sports, but not particularly basketball and while for me as a reader I could have done without some of the details of particular games or series, I can definitely see how the book called for it and really enjoyed the read.